I have a weed in my backyard. Every year, for the past 7 years, it has poked its head from the fertile soil in the border between the yard and the woods, looking oh-so cute and innocuous. Then I blink. Next thing I know, its nearly six feet tall with an equally wide canopy, covered with clusters of small, white flowers that soon develop into green berries that ripen over the summer to a deep, dark purple. Plants have a tendency to grow fast and wild here in the hot and humid South, so in late summer I’ll hack it down, which is surprisingly easy, given its size. There’s a small tinge of remorse, but after I clear out the wild vines and plants that have overtaken the neutral-zone I feel satisfaction. Throughout the fall and winter I sit at the kitchen table, remarking how nice and clean the area looks, all the while knowing that it is short lived. I blink again, and it’s early summer, and the weed emerges yet again. Its a fun little game we play, and I’ll miss it if it fails to return one year. But only for a small while, I only have room for one feeling at a time. 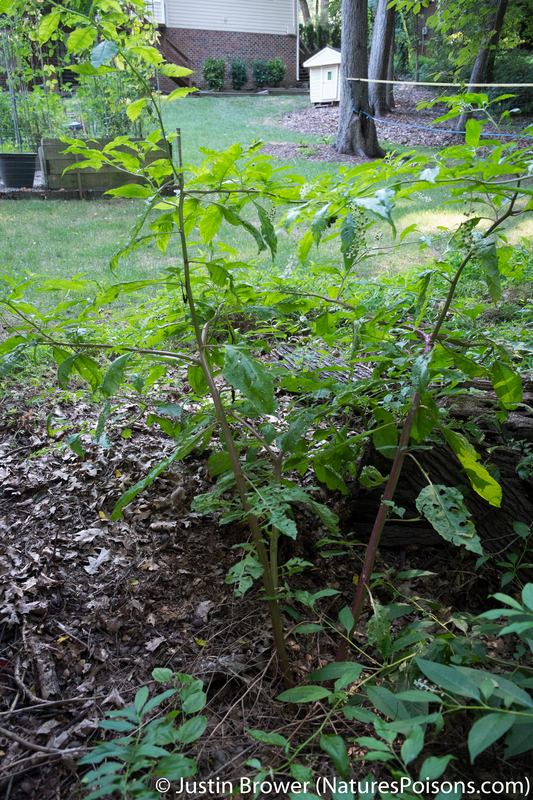 The weed I refer to is pokeweed, Phytolacca americana, an herbacious perennial plant, which explains why it’s so easy to cut down (non-woody) and comes back every year. It grows throughout the United States, and particularly the southeast, where it is literally everywhere. Along ditches, on the side of road, in open fields. Everywhere. But is it really a weed? I often read that a weed is just a plant that we haven’t figured out what to do with yet, so in that regard, pokeweed is certainly not a weed. In fact, pokeweed is edible. It’s also poisonous. It’s a poisonous edible that is deadly and delicious. Confused? Not for long. Pokeweed is edible and relatively safe . . . if you know what you’re doing. * First, the thick taproot and immature green berries should never be eaten. The young leaves and shoots are edible, so long as you pick them while they are small – plants less than 8 or so inches tall – and you boil them twice, changing the water each time. Mature leaves, or from plants that have red-tinted stalks, despite their size, should never be ingested either. It sounds like a lot of work to me, but people have been doing it for centuries. Hell, even Elvis sang about it. ** Swamp rock pioneer Tony Joe White, who wrote the song, covers it much, much better than The King, though. * I don’t know what I’m doing. It’s likely you don’t either. 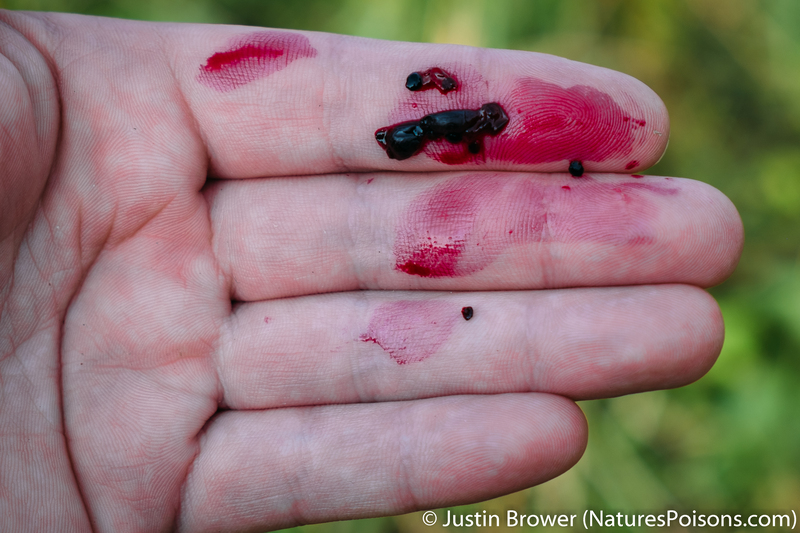 So if you feel an insatiable need to forage, find a local expert. ** Pokeweed is called Polk in some areas, after the 11th U.S. president James Polk. I’m sure you don’t care. So what happens if you don’t follow these rule? Incredible sickness. Violent nausea, vomiting, diarrhea, and urinary incontinence may be the least of your worries. Convulsions, transient blindness, and syncope (loss of consciousness due to low blood pressure) are of more serious concern. Scratch that…move crapping your pants over to the serious side. It is these effects though, that have made pokeweed a folk medicine. Teas made of roots and leaves have been used for centuries as an abortificant, a treatment for syphilis and scurvy, and a remedy for rheumatism. Early settlers learned of pokeweed from the Algonquin and Cherokee tribes, who also used the ripe berries as a dye for arrows and horses. In fact, pokeweed received its name from the Algonquin word “pakon,” meaning dye. Since it is so plentiful, pokeweed ink was commonly used, and many Civil War letters were penned with the ink. Here in Appalachia country, pokeweed is still used today as a “blood cleaner,” and prepared by cooking in hot grease – probably bacon. In a nutshell, if there’s something in your body that you want out, pokeweed is the right tool for the job. In Tennessee, a 68 year-old man was found by his wife sweating profusely, drooling, vomiting, and without any control of his bladder or bowels, before becoming unconcious. At the ED everything was basically normal, save for a blood pressure of 75/54 mm Hg and general weakness with inability to stand. Liver enzymes, ECG, CT scans, and “the works” were normal, and by the following day the patient was fine and discharged. What caused this man’s insides to want to go outside? Pokeweed. He was suffering from a bout of constipation and remembered what his mother would make when he was a child: pokeweed tea. He picked pokeweed leaves and stems from a plant in his yard and boiled them up. He placed the concoction in the refrigerator for several days, until he was tempted by the ice-cold liquid on a hot, sunny day. Ten minutes later, fluids were exploding from every orifice. Safe to say, he was cured of constipation. What devilish chemical, or chemicals, are responsible for this, and why would nature do this to us? Phytolaccatoxin is thought to be a main contributor, as well as various saponins – similar to solanine in green potatoes. 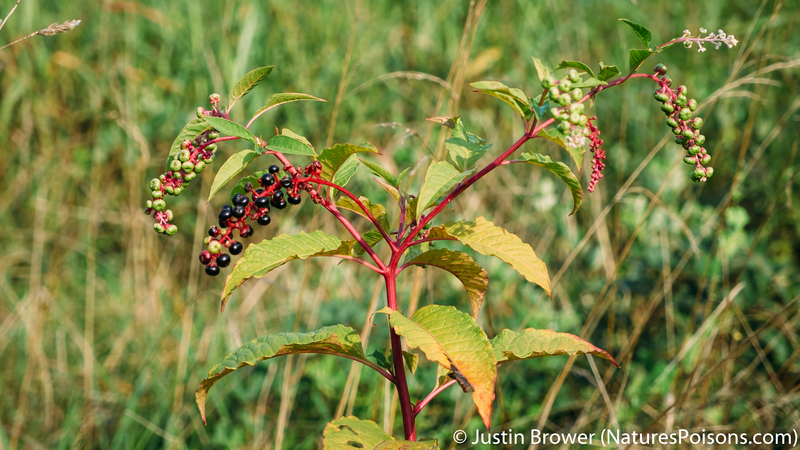 There are countless other natural products, but given pokeweed’s history and cultural significance, there is surprisingly little known about them. I would be remiss, however, if I failed to note that there are multiple studies investigating the naturopathic properties of pokeweed, for indications such as cancer and HIV. Nothing has panned out, but hopefully these last two sentences will cut down on the deluge of emails I get from angry readers. Yes, even I get hate mail. He wasn’t crying, or at least it wasn’t reported…but I bet he wanted to. What is clear, however, is that pokeweed is not to be taken lightly, and despite its edibility, special procedures and precautions must be followed. All you residents, fellows, and ED doctors in the South take note! And remember, Mother Nature has planted poisons everywhere, even my backyard. Review – “http://onlinelibrary.wiley.com/doi/10.1002/9780470330319.ch132/summary (2008): 800-02.
Review – Jolliffe, Georgina. “Phytolacca.” British Homoeopathic Journal 71.1 (1982): 31-34. Case Study – Jaeckle, Kurt A., and Frank R. Freemon. “Pokeweed Poisoning.” Southern Medical Journal 74.5 (1981): 639. Naturopathic Study – Maness, L., I. Goktepe, H. Chen, M. Ahmedna, and S. Sang. “Impact of Phytolacca Americana Extracts on Gene Expression of Colon Cancer Cells.” Phytother. Res. Phytotherapy Research 28.2 (2013): 219-23. Folk Medicines – Cavender, A. “Folk Medical Uses of Plant Foods in Southern Appalachia, United States.” Journal of Ethnopharmacology 108.1 (2006): 74-84. Tags: cholinergic, Phytolacca americana, phytolaccatoxin, pokeweed, SLUDGE. Bookmark the permalink. Well, of course you get hate mail. You’re clearly a shill for big pharma, my homeopath told me that cannabis oil cures cancer but people like you hush it up, you’re basically killing children right now. WAKE UP SHEEPLE! I sure wish Big Pharma was aware of this, I could use some of that shill money. I have seen this plant when I lived in Connecticut. It was growing pretty nicely in the wooded areas of nature parks. I am so glad you clarified this puzzling plant. It grows in my Italian field near the forest edge here in Lombardia, Italy and the gardeners nearby are terrified of it! I just read it was cultivated here for dye and then naturalized later in the 1600’s. Northern Italy has a continental climate similar to the North Eastern U.S. at least here at the Pre-Alps. I see all the weeds i grew up with in New York as the rainfall is similar. I used to smear the berries of Pokeweed in my hands as a child living in New York City and marvel at the color. What a plant! The gardeners here call it Fitolacca. Italians get to chop it down too! Wow! Going from an established photographer in New York to an Italian farm, I’m jealous. I wasn’t aware that pokeweed made it’s way to Italy, probably along the same times as other “New World” plants from the Americas, like tomatoes and chile peppers. I never gave it much thought. Thanks for the ideas and for reading! Laughed my keester off! Thank you, Justin, for the most amusing ‘This could make you crap yourself to death’ story I have ever read.